B.B. King: Bringing it home with a mellow, comforting sense of commitment. The interesting fact about B.B. King's first Christmas album is how the sum of the parts adds up to something greater than what went down in Maurice, Louisiana's Dockside Studios in June 2001. Taken individually, the performances on the album are warm and ingratiating enough, appropriate to the season, some treated in a lighthearted manner, a couple of blues getting down into the depths of feeling; but when it's all over, a spell lingers. There's something special about the imprint B.B. 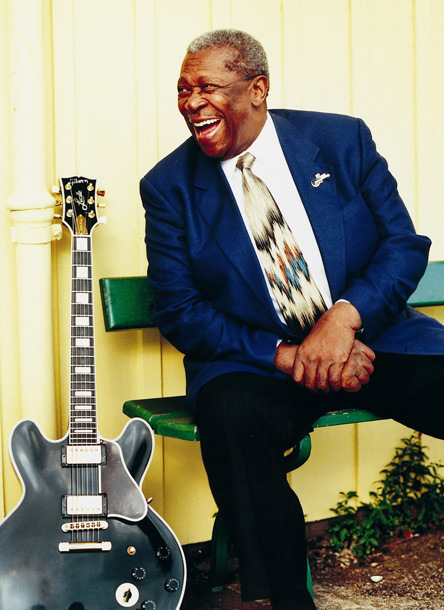 puts on these songs—the conviction in his voice, the personality he projects throughout, Lucille's sunny tone—and when that's coupled to his road band's high spirited accompaniment the end result is a model Yuletide blues album subtle enough to sneak up on a listener. Produced by B.B., A Christmas Celebration of Hope believes in itself, and its optimism burrows into the marrow as surely as did the lessons Scrooge learned on that fateful Eve. In fact, the project bears a kind of Dickensian pentimento in that all its profits were donated to the City of Hope, a biomedical research and treatment center engaged in some of the leading research into treating and finding cures for catastrophic illnesses such as diabetes (which afflicts B.B. ), HIV/AIDS, and cancer. Among the facility's notable achievements was the development of synthetic insulin, which has helped diabetics lead fruitful lives. Gene therapy, T-cell therapy and the development of cancer drugs are among its front-burner priorities. So this album recognizes a larger purpose for its music, and knowing that, B.B. and his fellow musicians bring it home with a mellow, comforting sense of commitment. An in-the-pocket midtempo blues from B.B.’s stalwart piano man/arranger of yore, Lloyd Glenn, "Lonesome Christmas" features a swaggering vocal from B.B., a rousing horn chart, and a couple of tart solo turns by Lucille in an arrangement far more cheerful than lonesome. Clarence Carter's suggestive Yule classic, "Back Door Santa," gets a driving, horn-rich (given the song’s lyrics, maybe “horny” is the right word) treatment, although it would be fair to say that B.B. doesn't quite inhabit the tune with the same gusto as Carter does in his original version, which doesn't make it any less enjoyable. A sumptuous love song, "Christmas in Heaven" gives B.B. a chance to croon a tender lyric about love and devotion, complete with surging horns and lush strings rising behind the vocal to heighten the romantic atmosphere, an approach that works to equally compelling effect on the tender sentiments in "To Someone I Love." Whereas B.B. could have doubtless delivered an affecting vocal on the seasonal favorite "I'll Be Home for Christmas," he opts instead to cast it as a cool, jazzy instrumental, with Lucille caressing the melody line before stepping aside to allow James Sells Toney to add Jimmy Smith-inspired organ variations on that same melody before Lucille returns to pick up the main line with only a bent note here or a brief crying note there diverging from the linear attack. The difference between the 1960 and the 2001 versions of "Christmas Celebration" (apart from the latter year's engaging horn-and-guitar dialogue near the end) is in B.B. 's approach: on the earlier cut his cynical pose rendered the title ironic, at the very least; a more mature B.B. sings with engaging sincerity to a woman with whom he shares a cherished history. Charles Brown's Christmas blues classic "Merry Christmas Baby" affords B.B. a chance to shout and growl the blues, and Toney hits those rolling piano notes with panache in an arrangement that affords Lucille a chance to get her lick in and play off Toney's inspired work on the 88s, as B.B. keeps upping the ante vocally to the point where he goes out with a roar, giving Lucille one last quote, a taste of "Jingle Bells," as the horns ascend and slowly fade out. A B.B. original written for this project, "Christmas Love" is an instrumental blues for a small combo, languorous and tender, designed for late-night cuddling by the fire, Lucille whispering sweet nothings throughout the track. The album closes with a jubilant rendering of "Auld Lang Syne," rich in rhythmic thrust, celebratory horns, a burst of organ, and a robust Lucille interpolation of the melody line, all of it coming together beautifully in a big, booming finale, a most fitting close to a hearty exercise in Christmas bonhomie. "It has been my long-time dream to produce an album of Christmas music," B.B. said in a prepared statement accompanying the album's release. "In addition, it is with pleasure that I dedicate this album to City Of Hope in support of their hard work to bring hope and healing to all people who suffer from life threatening diseases everywhere." 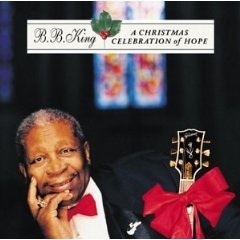 Honored with two Grammy Awards (for Best Pop Instrumental Performance for "Auld Lang Syne" and for Best Traditional Blues Album), A Christmas Celebration of Hope filled one of the few remaining gaps in B.B. 's life in music, even as it revealed a soul ever more grateful for what it knows of love.